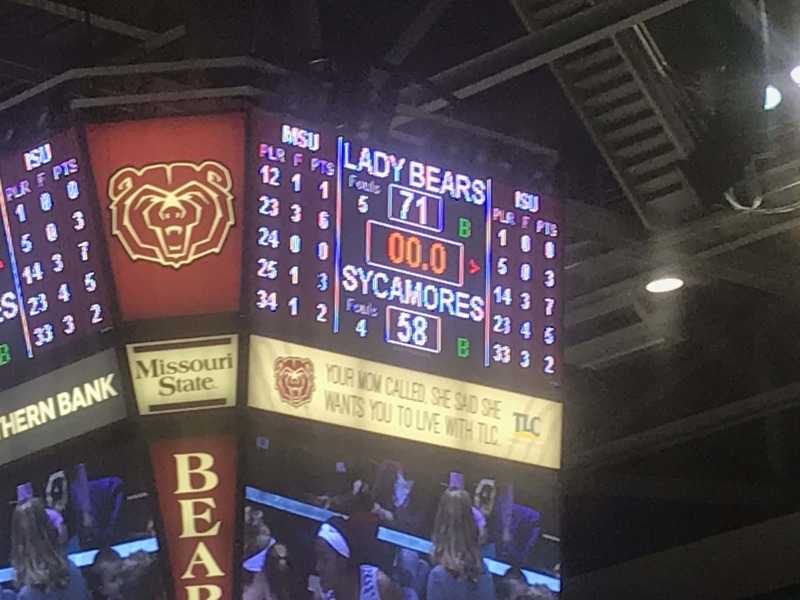 The Missouri State Lady Bears used a 15-0 first quarter run to jump out to a double digit lead and never looked back, downing the Indiana State Sycamores 71-58 Friday night in the Missouri Valley Conference opener at JQH Arena. The Sycamores jumped out to a 4-2 advantage three minutes into the first quarter, but the Lady Bears caught fire, taking a 17-4 lead with 4:17 left in the quarter on a layup by freshman forward Jasmine Franklin, who picked up her first double-double. Franklin scored 17 points and pulled down 11 rebounds, making eight of ten shots from the field, most of them in the paint. Indiana State got MSU’s lead down to six points in the second quarter, but the Lady Bears built the advantage up to nine, 39-30 at halftime and started off strong in the third quarter, outscoring the Sycamores 24-10 in the frame. Junior guard Alexa Willard added 12 points for Missouri State (5-7, 1-0 MVC). The Lady Bears struggled from the free throw line Friday, connecting on just 14 of 28 attempts. Indiana State was 14-18 from the line. Ashli O’Neal’s 14 points led the way for the Sycamores, who drop to 6-6 overall, 0-1 in the Valley. The Lady Bears will host the Evansville Aces Sunday afternoon at 2 p.m. at JQH Arena. Missouri State improves to 17-10 all time in Valley openers and is 55-18 in league play over the last four seasons. The Lady Bears are 19-4 in the their last 22 home games, dating back to February 10th, 2017. MSU is now 63-12 under Harper when scoring at least 70 points and 50-2 when holding opponents below 60 points. Everyone on the Lady Bears roster played in Friday’s game, and all but Bri Ellis, who saw only three minutes of action, scored. Friday’s announced attendance at JQH Arena was 2,015.